Mike Malyk, has lost over 100 lbs and just finished his first Boston Marathon. Tracy Garbutt is blind but didn’t let that obstacle come in between him and his life-long dream. 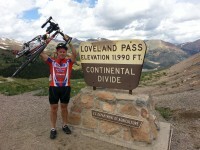 Joe Tasse has had 2 hip replacements – just a minor obstacle to completing the Triple By-Pass Road Race through The Rockies. If you think you have a barrier to what you want to accomplish, take some inspiration from this guys, listen in to this week’s Your Life, Unlimited radio show and enjoy Joe’s guest blog post on how you can use Emotional Intelligence to amplify your already great life! What is EI? A quick overview and why it’s important to everyday life. •Do we really know who we are? How do our brains get in the way of EI? I thought our brains were supposed to help us? How can we improve our EI? 3.Challenge your self-talk – our thinking drives our behavior. How Can We Maintain Resonance in Our Leadership, In Our Lives? In physics, resonance is a phenomenon that consists of a given system being driven by another vibrating system or by external forces to oscillate with greater amplitude at some preferential frequencies. One familiar example is a playground swing, which acts as a pendulum. Pushing a person in a swing in time with the natural interval of the swing (its resonant frequency) will make the swing go higher and higher (maximum amplitude), while attempts to push the swing at a faster or slower tempo will result in smaller arcs. This is because the energy the swing absorbs is maximized when the pushes are “in phase” with the swing’s natural oscillations, . . .
Dissonance in poetry is the deliberate avoidance of assonance, i.e. patterns of repeated vowel sounds. Dissonance in poetry is similar to cacophony and the opposite of euphony. Cultural dissonance is an uncomfortable sense experienced by people in the midst of change in their cultural environment. As leaders or just as individuals, what are some essential components of personal renewal in our lives? How do mindfulness, compassion and hope allow us to pursue personal renewal? We are all leaders in some way. How are they important to combating stress that is cumulative in our lives? Leadership requires the exercise of influence or power – having an impact on others, making things happen and taking responsibility for the organization. Leadership effectiveness requires the regular exercise of self-control, placing the good of the organization above personnel impulses and needs, which is stressful. During the experience of hope, mindfulness and compassion, it is believed that a person will have more neural activity through the LPFC than the RPFC, exciting neural circuits relating to happiness and amusement and experiencing neural activity similar to feeling excited, enthusiastic and interested. ^ Social networks = decrease mortality rates in humans; in primates, nurturing bonds between parents and offspring increases the length of survival of the parent for both males and females; cardiac patients with pets to care for live longer, due to decreased activation of the SNS. Working harder with less result. Getting home later or leaving earlier for work earlier each day. Feeling tired, even after sleeping. Having trouble sleeping. Finding less time to do enjoyable things. Not caring what you eat or whether you eat too much or too little. Not exercising as much as you used to. Frequently thinking about how you can “escape” your present situation. Joseph M. Tasse, FACHE (Fellow of the American College of Healthcare Executives) can be contacted at 586-255-1070. This entry was posted in Blog and tagged cjob, Inspiration, personal growth, podcast, Stephanie Staples, Your Life Unlimited. Bookmark the permalink. Previous Previous post: What would you do today, if you were brave?